A few months back a few members of my club took the 365 to try out. We ran a thousand rounds through the gun. It was a nice little gun. However as far as shooting, nothing really stood out. It shot well, accurate enough for all the shooters, but a little snappy. But still a pleasant gun to shoot. A number of us felt it shot like the Ruger LC9s but not quite as snappy. The funny thing was, none of us really cared or focused on the higher round count. The trigger to me, seemed better than the very light trigger of the LC9S for EDC. I have the Ruger, but moved to the Nano and so I prefer the double action. The gun handled and shot all the ammo without failure with the exception of 4 rounds, which we feel may have been contributed by shooters riding the slide. Something we warned all the shooters about before they shot the gun. The 365 for many felt the space between the slide and the receiver was much too narrow. At least it was for myself. I have a size large hand and this gun most likely would not work for me. Especially if I had to wear a glove. If you have a small hand this gun will work out fine. We had one lady shooter that loved the gun and later bought one. As far a bore axis being larger, than a Kahr, well, maybe so but bore height is subjective. My favorite Micro 9 is the Nano and it does have a higher Bore axis and I prefer that over a lower. That can be determined by the individual shooter. Like I said, the receiver to grip for me was just too short. My little Pico actually has more space for two handed shooting. Some of us also did not like the very bulky take down lever. Not sure why Sig went with this on a small carry gun. The magazines seemed cheap. Maybe they were Prototypes and better quality will come out at a later date. All said, it was a very Nice shooting firearm and the quality of the gun seemed very well made. It is small, easy to shoot for many. If you like that style of trigger and depending on how well it fits your particular hand then it will be a great gun IMO. I will give a illustration for the receiver of the 365 and grip compared to my Nano just for comparison. 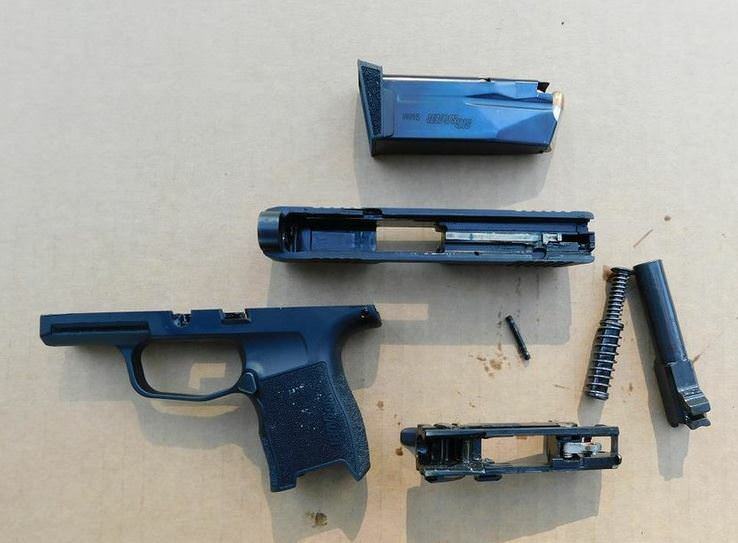 If you have a Kahr broken down, a Picture for comparison would be nice to see. I want to be very clear. This is JMO. And I want to be clear that this is a very nice shooting firearm. But like all firearms, one shoe does not fit all. A gun should be perfect for the individual shooter. This gun was not my cup of tea, but for many it will be right what the Doctor ordered. I think it will be a huge success. I sold my Shield last month, and bought a P365 with a Dec. 2018 DOB. Got it from a LGS that had 20 of them in stock! Out of the box, I noticed that the front sight was completely dead. Checking over at Sigtalk, I saw that a few others had experienced this same problem as of late. I spoke with a very knowledgeable and helpful lady at Sig CS who said they were out of sights to mail out individually, but had plenty in their shop. The quickest way to get it replaced, she explained, would be to send them the entire slide. They paid for FedEx both ways, of course, and got it back to me pretty quickly. I'm sure Sig will put a stop to these slipping through the cracks, but I suggest checking the night sights before accepting a P365 off the shelf at a LGS. For pocket carry, I've been spoiled by my RM380, CW380 and Seecamp, so I doubt my new Sig will see much pocket time. I prefer OWB for belt guns, and stumbled upon a heck of a deal on Amazon...a DeSantis E-Gat slide holster (leather) made specifically for the P365. It ride close to the body, high on the belt and fits the Sig like a glove. Retention is not adjustable, but I think it's perfect as it is. It also has wider belt loops than most small holsters, and fits my 1 3/4 inch belt with a little room to spare. It's not Del Fatti quality, but it's much better than a similar Don Hume I have. I got it from J.D. Holsters through Amazon for $24.95 with free shipping, and for that price I think it's a steal. I haven't fired the Sig yet, but am really looking forward to it. ....x2. Thank you....saved me from having to formulate a same sort of reply. Recently had a friend shoot himself in leg with his Glock 19. He is a retired Military Armorer, now range master, gun enthusiast, has been around guns all his life. Loves to build AR's and as long as I have known him, he as been a Glock 19 fanboy. Turns out, he was headed to the range, gun was in the holster and when he opened the door and bent over to place items in the car, the gun went off. The Bullet went into his hip and traveled all the way down his leg, just missing the Femoral Artery. I saw pictures, just a horrible nasty wound, but he survived. He told me that for some reason the gun just went off. Nothing was caught in the holster, he said he has taken the gun all the way down and inspected every part. He said he had no strings that could have caught on anything. He is baffled as to why this has happened. Says he has looked closely at this holster, his clothing, every thing. Each to his own on what they choose to do. Personally I have moved to double action and love it. No more light striker fired triggers. I am done with them and actually enjoying D/A's more. Ironically about 3 or 4 months ago, we had another accidental discharge, a shot into the leg. It was also a Glock. I am not in any way disparaging Glock as there are many light striker fired guns out there. What is interesting is that the very similar gun now being sold like the Glock 43 is the Mossberg MC1. It has a optional safety. I wonder if he had any modifications to his G19? One thing I’ve always questioned is firing pin blocks? Who has actually tested dropping the full force of a charged striker or hammer driven firing pin into a firing pin block to see if the firing pin block will let it hit the primer? In my mind firing pin blocks may stop the inertia of a firing pin in a dropped gun but what about a hammer jumping the seer or a trigger bar slipping off a striker? Bawanna may can correct me on this but in a Glock a functioning cross shaped trigger bar thingy shouldn’t slip from a striker without the trigger being pulled because it has to travel back and down? Now one that is worn or had a “25 cent” trigger job, that may be something different. Nice writeup. The Kahr and Sig safeties are different from Glocks. In our range the LE's have put 8 ND's through the walls of our cleaning room all Glocks and many agencies carry Sigs and Beretta's. If the Sig P365 does make you nervous, they are now available with a Safety lever but as often stated it's another step in the process of getting the gun to fire and over the years as a bullseye shooter I saw the safety's on a 1911 fail many times not to mention a number go full auto during a five shot string of slow fire. People always tinker and that can lead to disaster. I saw a video once, where a guy with a G26 in a canvas holster shot himself in the arse. It was an IWB holster and as he sat down the fabric of his pants pulled on the fabric of his holster, and boom. That's why I don't do cheap holsters anymore, too scary. The Glock "safety" just keeps it from going off if you drop it. I have watched the California drop test on a 1911, without a firing pin block (aka 70 series), fired every time. They were dropping it on the muzzle, from 6 feet, inertia caused the pin to keep right on going. Supposedly the S&W 1911's have Titanium firing pins, which lack enough mass to fire, don't know that for sure. Supposedly the S&W 1911's have Titanium firing pins, which lack enough mass to fire, don't know that for sure. It’s reported that Ruger is doing this too in their handguns without FP blocks. Including their budget minded Security 9 which also has a thumb safety.
" They are ugly, but they go bang every time." Apparently, they do. I own striker fired arms, but have always felt more comfy with my da/sa's. The only Glock I have personally shot was a model 20. Shot it quite a bit. It belonged to a friend of mine, who couldn't hit the side of a barn with it. I kept telling him it was because the firearm just did not fit comfortably. He got such a deal on it, that he just couldn't part with it. I just couldn't ever trust them myself. Otherwise, it wasn't horrible, just not for me. I still wouldn't trust one, except to go bang of course.